MS Ashmole 1431 ff. 15v-16r. Bodleian Library, Oxford. derives from a thousand years earlier, and has been found in use in this century. I recently came across a fascinating book, A Cretan Healer's Handbook in the Byzantine Tradition by Patricia Ann Clark, the publication of a document which she studied over many years in Crete. 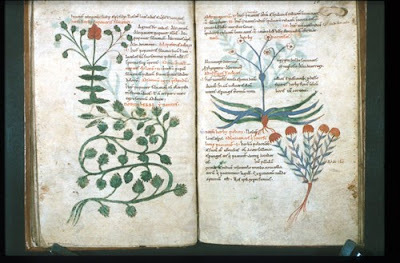 The document, a handbook of medical cures, or iatrosophion, had been copied in 1930 by Nikolaos Konstantinos Theodorakis, a healer from Meronas, Amari, Crete. Clark spent years in Crete, talking to other healers and listening to their explanations, and says that there are probably 240 of these iatrosophia in existence. Most are from the 18th and 19th centuries, but some are earlier. The contents have been copied over and over since Hippocrates, Galen, and Dioscorides, with cures added in as new substances came to hand, or as Christianity brought new prayers, or as people went off to medical school at Padua and came home with new information. In 1934 a botanist reported an encounter with a healer-monk who carried with him four manuscript volumes of Dioscorides that he had copied out himself. Take a snake, cut off its head and its tail, throw them away and the rest chop it into pieces, put it in a pot and smear it and leave it considerable days until you know that it has formed worms. Open it, gather the worms and put them in a heavy pot on the fire, roast them, make a powder very fine and put this powder on the eyes and when you have put on a coat of half of a quarter of the amount, have sugar, very fine and put it onto the eye and it cleanses. Sure. First count how many there are and you take just as many plane tree nuts and you go and pour them out at the banks of a river and when they have rotted, the wars are destroyed. But you should do it at the waning of the moon. Take the bulb of an onion and cook it and put it on top of the root of the tooth. . . . (and for a cavity) A little tar and unslaked lime, you should soften it well, the pain disappears and the tooth disintegrates too. First let him have a moderate, regular life for two days, later take one dram of oak gall, pound it well, put a piece in with wine and have him drink it in the evening and have several pounded onions and garlic and put them in a pot and put in also two bricks, but you should have them well heated in the fire, and from above quench them with strong vinegar and he sits on top and is steamed well, then he drinks again the oak gall and lies down like this. Do this three times . . .
Πρὸς δεύτερα γυναικός: παγούρους ποταμίους θὲς ἐπ´ ἀνθράκων καὶ ὑποκάπνισον αὐτήν, ἀγριοκαννάβου ῥίου δίδου πίνειν νῆστις. 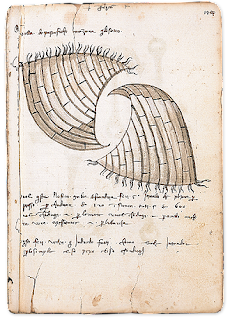 For a woman’s seconds [afterbirth]: put river crabs on charcoal and smoke her, give [her] fasting a drink with grated cinnamon wood. These are close enough -- both use water animals and fumigations -- and the Theodorakis text shows that his source came from two different sources. ἠ δὲ τιμία σου κεφαλή ἔκραζε καὶ ἔλεγε πιρετός δυταίος τοῦ θεοῦ, . Σ . Μ . Κ . Λ . Σ . Μ . Τ . Ρ . Θ . ἀμήν. Ἠλί, ἠλί, λιμά σαβαχθάνι τούτέστι θεὲ μου, θεὲμου, ἴνα τὶ μὲ ἐγκατέληπεις τόν δουλον του θεοῦ. . . . χριστός εὐηγγγελήσθη φύγε ρίγος. χριστός ἐγενήθη φήγε ρίγος. Ξριστός ἐβαπτήσθς φύγε ρίγος ἀπό τόν δούλον τοῦ θεου. . . . Ιησοῦς Χριστός νικά καὶ βασιλεύει εἰς τούς ἀιώνας. And your holy head (of John the Baptist) cried out and said, 'Fever of the second, third and fourth both days and nights, flee from the servant of the Lord, . Σ . Μ . Κ . Λ . Σ . Μ . Τ . Ρ . Θ . Amen. Ili, ili, lima savachthani, this is, my God my God to what purpose do your forsake me, the servant of the Lord . . . Christ is proclaimed, flee fever chill. Christ is born, flee fever-chill. Christ is baptized, flee fever-chill from the servant of the Lord. . . . Jesus Christ triumphs and rules forever". There is great similarity between the two fever prayers, which are certainly for malarial fever, and if you think they are somewhat overwrought, you have never known the desperate fever or the bed-rattling chills that come with malaria. I knew malaria well as a child in West Africa, and I have a visceral response to these prayers. Theodorakis and Michael have other similar cures, such as when Theodorakis says that repeating the Credo (τό πηστεύω) three times is a cure for scrofula, and Michael says that three repetitions each of the Pater noster and the Ave Maria will allow a woman to give birth. I suspect I could find many more similarities between Pepagomenos and Theodorakis. The image at the top of the page is of the opium poppy: it was used by both healers. Theodorakis' cures give such an awful view of the possibilities faced by pre-hospital populations, it is a great comfort to know that at least opium was known, and sometimes available, to them. Agia Fotini, Mantineia, Arkadia. North side. I know very little about Ag. Fotini at Mantineia. We stopped there, briefly, so most of the others could give a scholarly eye to the ruins of Mantineia. I was told that the church was built, one stone at a time, over thirty or more years, by a visionary lawyer from Tripolis. (A few construction photographs here.) I was also told that the Bishop had refused to consecrate it until the builder replaced his own portrait in the dome as the Pantokrator in bluejeans with a more conventional Pantokrator. If readers have more and better information, I would be grateful to hear from you. 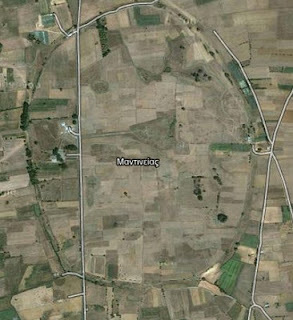 within the wall circuit of ancient Mantineia. Somewhere in the original design is a memory of a Byzantine church, but where nearly every other "new" Byzantine church in Greece bears the stifling ugliness of poured concrete, this one is an ecstatic revelation of materials and forms, and what seems random and disproportionate begins to reveal an intensely personal logic. The workmanship is solid, the masonry excellent, if all the perpendiculars and parallels are not perfectly conventional, and in places such as the brickwork here, there is the same movement of intensifying soaring praise that I saw in the Gloria gloria gloria spiralling around the spires of La Sagrada Familia. In fact, La Sagrada Familia is the church I know most like Ag. Fotini in character, and I think of Gaudi, as I do of Ag. Fotini's builder in terms of Yeats: And what if excess of love /Bewildered them . . ./A terrible beauty is born. as functional pieces, rather than as surface decoration. Apse leading from the mountain of the Lord. but it is a structure that intends to soar. Once you come to enter Ag. Fotini, the proportions are humane, easily understandable. The interior is tender, light-riddled as suits the name of Fotini. The interior creates spaces of intimacy over and over. The iconostasis is a gate rather than a barrier. It is easy enough to name off all the different kinds of architecture incorporated into the fabric, but really, it is all of Greek history brought to support an anthem of praise. Ag. Fotini was the Samarian woman at the well, and the apolytikion for her feastday says All illumined by the Holy Spirit. * John J. Yiannis, "Coping with the Imported Past: A theme in Greek and Greek American church architecture," in Αναθήματα Εορτικά: Studies in Honor of Thomas F. Mathews, ed. Joseph D. Alchermes, (Mainz, 2009) 318-326. That is all we know about Michael's role in John's life, and given John's experiences on board ship, both trips, John probably never wanted to see him again. The Document of Union was signed on 6 July 1439. Despite his personal misery, John made a fine impression, "with a hat in Greek style on the point of which was a beautiful jewel, a handsome man with a beard in Greek style." There were still more days of bickering, and then, on 20 and 21 July, more signing so that all the right people could be sent copies. A group of Greeks then left immediately for Venice, and on the 25, John's brother Demetrios left with Georgios Gemistos Plethon and Scholarios -- the three of them strongly opposed to Union. Possibly John was not well, as on the 28th, John he made a pilgrimage to a healing shrine, and then had his famous visit and lunch with Giovanni di Pigli who saw how much trouble he had walking. He was in Florence some time longer, not arriving in Bologna until 31 August, but the ships were nowhere ready to leave. The imperial ship was blessed and launched on 13 September -- the Medici had sent up 6000 florins on behalf of the Pope for expenses -- but there was a fire in the arsenale that night and another long delay. John made a trip to Padua. After he got back, the Greeks had a liturgy in San Marco at the request of the Doge which was a great cause for upset once people got back to Constantinople. John was ill and did not attend. Then they had a funeral service for the Patriarch, Joseph II, who had died in Florence where he had been buried in the cathedral. It was not until 14 October that the Greek delegation actually boarded their ships to leave. The Pope had insisted, because of the expense, that a hundred go on each galley, and the crowding was justifiably much resented. That night a storm broke the ships from their moorings, and smashed in the side of one. It took three days to repair the damage. (Two years earlier, when they boarded the ships for Venice, there at been an earthquake the first night.) The delegation actually sailed on the 19th. Leaving Pola, they encountered contrary winds and had to wait three days. More bad weather forced them to stop at a deserted island, where they thought they had lost the Emperor whose ship had only half the oarsmen that it should. Then at Ragusa there was another storm, so violent that they did not expect to live through it. Once they were able to sail again, another storm blew them far off course. At Corfu, the ships had to wait for the Emperor's galley to catch up. The Corfiots were upset about the Union and argued with the Emperor who gave them their own signed copy. From Corfu to Methoni the sailing went well and they arrived on 16 November. They stayed there for more than a week, the Greeks of Methoni protested the Union, and there was a more-or-less joint liturgy celebrated by a Latin. The Mistra delegation left the group, freeing up a little space on the galleys. The Emperor went by horseback to Koroni where there was another demonstration of antipathy to Union and where he rejoined his galley. Passing Cape Malea, there was another terrifying storm. The sight of the columns of the temple of Poseidon at the Cape of Columns gave a bit of hope, the wind was down, the sea calm. Then there were two days of drenching rain while they struggled to attain Negroponte. At Negroponte, another joint liturgy was celebrated by a Greek. The priests of the island made a great protest about Union. After ten days, they were ready to sail again, but John decided to wait for couriers from Constantinople, and then the weather turned nasty. It was two weeks before the other ships could sail, up the coastline, to Oreos where they waited for John. George of Cappadocia died after a long illness and they buried him in a little island church of St. George After ten days without the Emperor arriving, they sailed back down to Negroponte to sit out fifteen days of snow and ice. It was learned -- couriers actually arrived -- that John's wife, Maria, was ill with plague but no one told John. They were ready to sail when a relative, Konstantinos Palaiologos, died and it was arranged that the interpreter, Nicolo Sagundino, would see to his burial. They were able to use their sails past Skyros and Skiathos, but then were forced to stop at the little island of Cheliodromia for a storm. They ran out of food and water, then sent a galley to Skopelos to get provisions. Two days later the galley brought back seventeen loaves of bread and a donkey to use for dog food. (Had you realized John's hunting dogs were sailing, too?) There was debate as to whether they should return to Negroponte, or go to Crete, or to Lesbos. Then the ships became separated -- the details get lost at this point -- and they met up again in the harbor at Pelagonisi. Also while he was out hunting, word arrived of the death of his wife, the Empress Maria, and of Demetrios' wife Zoe. It was decided not to tell either of them, or else it would be two weeks before John would be able to sail. Another storm. A four-hour sail to the Hellespont. Gallipoli where they encountered a Venetian ship that had left Venice two weeks after them. The Emperor took on board several men, lions (lions? that's what the Greek says), and dogs that he wanted to take to Constantinople. At Gallipoli the Turkish governor sent greetings to the Emperor, and John sent him a silver vase in return. From there, it was two days to the port of Hebdomon, just outside Constantinople, where the governor of Constantinople -- Paul Asan -- came with a small group of people to greet them. They sailed around to the Golden Horn and dropped anchor near the arsenale where they received another welcome and spent the night. It was necessary to prepare a grand entrance for the Emperor's return. The next morning, on 1 February, a galley with Constantine and a great many Italians came to conduct them formally into port. Trumpets and chanting accompanied them from along the shore. Once on shore, Constantine led a horseback procession to the palace. Since it was known that John did not know of his wife's death, there was a great show of celebration. But at the palace they encountered mourning. John had been told privately that Demetrios' wife, Zoe, had died of plague, and Demetrios had been told privately that John's wife had died, so each thought it was for the other's loss. The "holy Empress" Helena took her sons into a private room and told them that both their wives had died. John was immediately ill, in bed for three weeks, his exhaustion, gout, and grief worsened by the fury of the anti-unionists. No one bothered to report about Demetrios. I have no idea what happened to the lions. * Comito: actual commander of the ship, what we understand by captain. When Michael says captain, he means the individual in command of a group of ships or galleys. Paron, dialect for patron, or the investor in the voyage who takes the physical risk of travel. Armiraio : responsible for navigation. 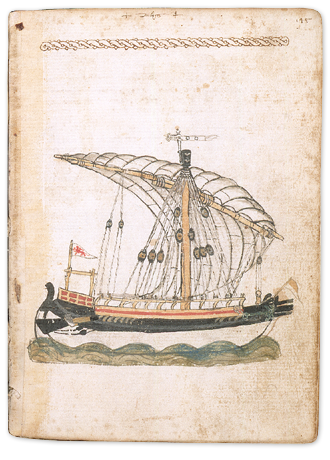 The drawings are from the Michael of Rhodes manuscript in which Michael recorded information about his voyages, routes, notes for shipbuilding, cures for illnesses, and much else. The 200-page manuscript has been splendidly edited and published in three volumes at M.I.T. Press by a group of scholars which included Alan M. Stahl, Curator of Numismatics at Princeton, Pamela Long, and David McGee, and has recently won the biennial Eugene S. Ferguson Prize for the best reference work or edition from the Society for the History of Technology, and the Jameson Prize for the best edition of a primary source important for historians from the American Historical Association. Aerial view of the (modern) Venetian Argolid. Once the peace settlement for the Venetian-Ottoman war had been put in writing, it had to be worked out on the ground -- literally. The 14th provision of the settlement provided for lands taken by the Venetians to be returned to the Ottomans, and the 15th provided for lands taken by the Ottomans to be returned to the Venetians. This meant that, in many cases, both sides had to determine what actually belonged to whom. There were two main issues for the Argolid. 1. The Ottomans held Argos: Argos had not actually been taken in the war, but before the formal declaration of war, so it was not covered by the 15th provision. 2. 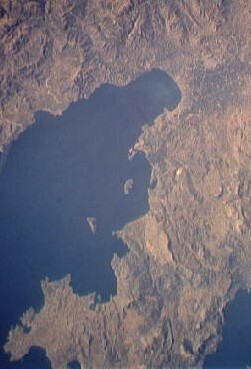 The Ottomans held the entire Argolid peninsula as the result of the surrender of Demetrios Palaiologos in 1460. It had been agreed in correspondence between the Doge, Giovanni Mocenigo, and Mehmed, that the boundaries were to be those boundaries. However, Demetrios had appropriated the territory in about 1449 (#3 here) despite the treaty made by his uncle Theodoros in 1394 which assigned this territory to Venice, and the matter had been in negotiation when the Morea disintegrated. A third issue was that the sançak-bey of the Morea, Suleiman, had arbitrarily set Nauplion's boundary at the stream of Profitias Elias, on the road to Tiryns, and Nauplion was strangled for land for its food. The governor, Bartolomeo Minio, had had two tense and unsatisfactory encounters with Suleiman on this matter. Whatever the attitude of the sançak-bey, Minio's letters show that he was tense, legalistic, and hostile. The official boundary commission arrived in Nauplion on 12 August, 1480. The Venetian representative was Giovanni Dario, and the Ottoman was Sinan Bey, protogero of Greece, the official over the sançak-beys of Greece. Minio was less than a week out of sickbed after nearly dying from an attack of malaria. He was not ready for all this, but he found a house for Dario and another for Sinan -- "the best that I could manage, considering the condition of the place" -- making him a gift of 30-40 ducats "so that Your Lordship's affairs will prosper." Sinan sent for the sançak-bey, and the cadis of Karitena and Kalavrita. When the Turks arrived, Sinan, Minio, Dario, and their staffs met them at Argos where they were joined by the cadi. They seated themselves in the sançak-bey's pavilion -- a great tent -- and went over the main issues to be settled, the castles of Kiveri (actually, Myloi), Kastri (Hermione), and Thermissi and the salt pans. Minio immediately said he had documents demonstrating Venetian ownership. The Turks said they had documents demonstrating Turkish ownership: these territories were listed in Mehmed's cadaster of 1460 and had already been assigned. They spent two days arguing this. The Venetians produced witnesses, beginning with the Greek bishop (possibly Demetrios Pigasi), and then the oldest citizens. All the witnesses testified for the Venetian position, and the testimonies were written down in Greek and Turkish and compared for accuracy. The Turks agreed with them and said that Mehmed made the final decision. Then there was the boundary between the actual cities of Argos and Nauplion. Minio said he had documents and witnesses: more important was the fact that Nauplion territory had 20,000 people and Argos fewer than 200 households (or about 800 people). Nauplion needed a fair share of land. This was fine with the Turks, but they wanted to leave the Albanians out of the population numbers, since they were foreigners. (This would have reduced the Nauplion population by at least 4000 people and possibly several thousand more.) There was an impasse. Finally, they decided to ride the boundaries while the oldest citizens from both sides pointed out where the line had traditionally been. They began across the bay from Nauplion, at the White Tower by the shore and "the river which is ours," went up to Kefalari, then started east across the plain. No problems were found and, coincidentally, Nauplion fiefholders in the area had made more gifts to Sinan and the sançak-bey. As they went along, a secretary for each side noted descriptions, wells, trees, points of significance, drawing out a map. Once they encountered an Albanian settlement which had been paying taxes to both the Ottomans and the Venetians, in the hope of being left alone. A problem came up when they got to the monastery of Osios Theodosios (Minio called it San Theodosio). Osios Theodosios at the end of the road, quite isolated even now. Google maps (click to enlarge). 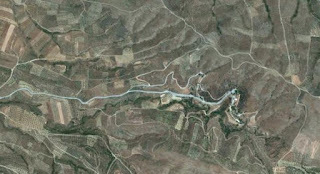 Another problem came up when they got to the end of the bay of Drepanon, and the mountain pass giving access to the narrow coastal road to the plain of Candia. Nauplion's stratioti had been given the land at Candia to support themselves, and pasture their horses. Further, this land gave access to Kastri and Thermissi. The Turks produced two witnesses "of the vilest sort" who testified that, on the contrary, this land had always been despotate territory. Minio said he had documentary proof of possession. The Venetians asked for their own witnesses to be heard on this matter. Then Sinan said he had no authority to hear witnesses, and that this territory had not been mentioned in his commission. It may or may not be relevant that there were no fiefs in this area whose fief-holders could make gifts. It was August. It was hot. Minio was still weak, and Dario had chest pains. We don't know how Sinan and Suleiman felt, but at this point they had spent 10 days on horseback and matters were not going well at all. There was a great crowd of concerned citizens, potential witnesses, and the curious, trooping along with the dignitaries and their staffs. No one seems to have noticed that the beach at Drepanon was lovely and that they could all do with a swim. Instead they broke up and went home. Dario, however, went back to Argos with the Turks. Dario spoke Turkish, liked Turks, and he and Sinan were well-acquainted. The next morning Dario sent Minio a note to say Sinan had agreed to Osios Theodosios, and to leaving a route to Thermissi. Candia was still at issue. Minio called in the citizens and showed them the proposal. It was generally agreed to accept Sinan's proposal, but keep Candia open for discussion, and they offered a few modifications of the dividing line. Minio sent a messenger to Dario. Dario sent back the messenger with a note suggesting that representatives from both sides go look at the two sets of proposed boundaries one more time. So six men from Nauplion met six men from Suleiman and they went out to look again. They came back and reported that they all agreed with the Nauplion lines. Sinan said Nauplion could have Candia until further notice. It should be noted that these discussions had been primarily between the two governors involved, Suleiman and Minio, with Sinan and Dario mediating. So Dario acquired, without Minio, everything that Minio wanted. The agreement had to be submitted for Mehmed's approval. Mehmed sent a letter saying that, although Kiveri, Thermissi, and Kastri had been given as timars to his people, he was returning them to Nauplion for the sake of peace. Mehmed died three days later and it all had to be done again. People from Beyazid's new sançak-bey met with Minio's people and went over the lines in April 1482, very quickly. April in the Argolid is a delight -- yellow flags grow in the coastal streams, the fields are full of poppies, the nights are cool. There was a period of delay while various timar-holders argued against the former lines, and once again Minio started bringing out witnesses and documents, but they were confirmed without too much difficulty. Again, the agreement had to be submitted to Beyazid, and again, approval was given. Both times, the details of the boundaries and the agreements were written down by the Turkish scribe and Minio's secretary, and two copies made in Greek which were compared for accuracy. The documents for Constantinople were signed by the Venetian side, and the documents for Venice signed by the Turkish side. Somewhere in Venetian archives is the boundary commission's map of the Argolid boundaries. I have examined every unidentified map in the Archivio di Stato, trying to find it. There are more archives, more papers to be discovered. Read about the boundary commissions in more detail here. Minio's letters reporting the boundary commissions can be found here, particularly in letters 5, 21, 22, 74, 77.
peace with Venice, 25 January 1478 m.v. The cahd-name was a statement of terms for peace, not a peace agreement, and it was a more generous agreement than Venice could have hoped for. You can read it and read about it here, but I want to write about its dating. The document is in Greek -- communications from Istanbul to Venice were normally in Greek -- and so is the date: ,ςϠπζ. There is a line over each character in the manuscript which I cannot duplicate here but you can see it at the end of the second line in the image below. κήρωσην τὼν ἄνωθ(εν) γεγραμένων καὶφάλαιων καὶ ορκωμοτηκῶν.
. . . of their fortresses which neighbor with the lands of my Lordship on all sides. The above-written provisions are confirmed and ratified and sworn. the 12th indiction, the 25th of the month of January, in Constantinople. That number ,ςϠπζ translates to 6987 because Greek dating starts with the creation of the world. Lets not go there. Now for the problems with 6987. The Greek year starts with September, ours with January, the Venetian with March. Normally, in conforming Greek dating with ours, one subtracts 5509 if the date is between September and December, and 5508 if the date is between January and August. 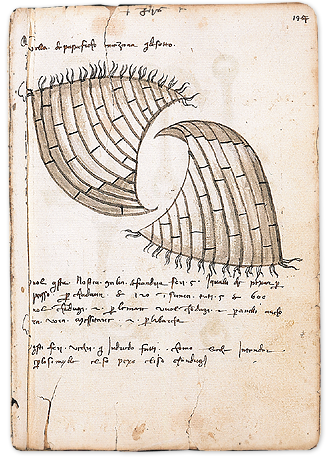 But if it is a Venetian date -- more Veneto or m.v., 5509 is used for September through February. This assumes that we know the month. So the Venetians understood that the cahd-name was issued in January 1478. The subject of dates comes up because a recent correspondent took me to task for using 1478 in my article on the document, condescendingly explaining, "Hence we convert any dates falling in Jan and Feb to the following year." Well, that depends on who "we" are, and the problem with authority-based work is that "we" have to choose an authority. I would like to say that I have opted for the document as my authority, but I chose instead to use 1478 instead of the 6987 chosen by the scribe whose employer, Mehmed, would himself have been using hijri dates. I have used my authority to interpret the date for readers, and I have opted for the date the Venetians would have known since they were the people most involved. Also, I think it is more interesting. A correspondent (Comments, below) questions scribal choice. I think this is an important issue so I want to put my response here, rather than in the Comments. I have looked at my copies of all the surviving Greek copies of Ottoman cahd-names and correspondence with Venice for the 15th C. More than half have no year dates at all, only the day and month. One cahd-name, written in Greek, has the Venetian date written in Greek numerals. The evidence indicates considerable leeway for the scribe. Also, in the copies made in Greek by Greek scribes for the Venetian records, the dates are also in Greek -- this reflects the Venetian characteristic of copying as exactly as possible: I suggested this in the entry on The Argos Petition though I did not give the Italianate text.